Numerous challenges face the photographer new to shooting the sport of American football. Whether you are shooting for editorial outlets, for stock, or as an event photographer, you face circumstances not normally encountered in everyday photography. In this article I will offer advice on the basics of shooting American football, and how to improve your results quickly. Sports photographers often refer to “keeper rate” as the percentage of good photos you capture versus the total amount of photos you take. 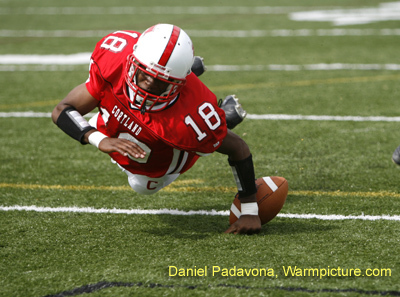 I have photographed football for several years as part of a collegiate football website. My keeper rate steadily improved each year as I gained experience. But a big jump occurred when I switched to a Canon 1D series camera. There are many cameras which a skilled photographer will have success with when photographing football. But the 1-D offers advantages in capturing football which other cameras do not. The first advantage is the fast, accurate focus tracking of the 1-D series. No matter how skilled the photographer, the auto focus needs to be incredibly fast to keep up with fast action. You can get by with a slower focusing system when photographing high school football. But once you step up to college or the pros, the speed of the players increases to the point of stressing even the most advanced auto focus systems. The 1-D series cameras are weather sealed, which is important any time you are shooting outside in unpredicatable conditions. The body is very durable. I would never abuse a camera, but crazy things happen when big football players fall into photographers. I want a camera built to last when shooting football. Another thing I love about the 1-D is the fast burst mode. The more pictures you can capture per second, the better. After using the proper technique, luck comes into play. You increase your chances for a winning photo when you shoot more images per second. For this reason, you should always shoot fast action sports in JPEG rather than RAW. RAW images take too long to process, lessening the amount of images captured per second. A good lens is a must too. Ideally a 400mm or 600mm lens should be used to cover the field. If you are stuck in the home end zone, and the teams are playing near the visitor end zone, you will need a serious lens to reach that far. But you can definitely get by with less length if price is an important consideration. Quality lens construction will be the most important factor. I’ll let you in on a little secret. I made my most money with the Canon 70-200mm 2.8 image stabilized lens. They don’t come cheap, but they are a fraction of the cost of the big glass you will see on the sidelines. The 70-200mm 2.8 is sharp, and focuses fast. When the action gets close to you, you can quickly zoom back to capture the players. You can’t do that with the big fixed focal glass. I almost always set my shutter speed at 1/500s to 1/1000s. Any faster seems to be overkill. I adjust aperture to get the exposure right, but try to aim for f2.8 to f5.6. That range gives a pleasing depth of field. You want the subject player to be in sharp focus, with the action behind him out of focus. This creates a less cluttered look to the image, and draws attention to your subject. I tried a lot of different exposure strategies over the years. One of my favorite techniques is to expose for the white stripes on the referee uniform. When checking the histogram on my LCD screen, I want the white stripes to be just barely blinking, meaning I have maxed out my exposure of the whites. Any higher and the image is over exposed. Any lower and the image may be too dark. It’s a simple technique, and it works wonders for me. I don’t increase ISO above 100 unless the lighting dictates that I must. If you must raise ISO, make sure your exposure is dead on. I have shot 1600 ISO images at night in the rain and still had very little noise in them because my exposure was good, and the 1-D is just great with keeping noise low. The most pleasing colors and contrasts I have captured shooting football came with the sun coming at an angle from behind me. This gives you the best combination of contrast, while still getting some sunlight on the faces of the players. You will have to position yourself relative to the sun, and the action on the field, to get the best contrasts and colors in your images. This is no easy task when shooting mid afternoon football games under harsh sunlight. If you have a 1pm kickoff, lower your expectations for beautiful colors. But be vigilant of how the autumn sun changes between 3:30 and 4:00 pm. The colors and contrasts get much more pleasing by late afternoon. Some people prefer backlighting when shooting football. There is a good reason for this. Football helmets shade the players’ faces, often yielding faces so dark that the player cannot be recognized. This is especially bad for an event photographer looking to sell photos of players. Who wants to buy a photo of their kid when they can’t be recognized? By utilizing backlighting (the sun is completely behind the players), we can expose for the whites on the jerseys and still get the player faces without much shadow. Of course we could go with pure front lighting too. But I find that there are still a lot of shadows because the light can’t get under the helmet. And you will have poor contrast with pure front lighting. them when they plan on running or throwing? Knowing these things ahead of time will get your camera focused on the right players, at the right time. If you are constantly reacting rather than anticipating, you will have a low keeper rate. Set your auto focus to use the center point. I have talked to a lot of sports shooters, and they all agree that the center point focuses faster and is usually more accurate. This seems to hold true with any DSLR, not just the Canon 1-D. I have shot football with the old 5-D and 10-D Canons and had similar success using the center point. You will want to use AI servo mode as your focus choice. Use continuous focus, following the action with a straight horizon. Keep your knees slightly bent, with your finger ready to fire the shutter in burst mode. When you sense that something important is about to happen, start shooting in burst mode. Keep firing until the important portion of the play ends, or you lose the subject. Pan steadily, keeping your arms and legs relaxed. After a shoot, make a rough estimate of your keeper rate. Write down what you did right, and what you need to change before the next game. Take note of shots which came out great, and the technique and conditions which made them great. How were you positioned on the field? How was the lighting? What was your technique like? What were your exposure settings? Keep shooting. The initial keeper rate may be frustratingly low. But you only get better with experience and learning. By continuously critiquing your own work and asking questions of more experienced shooters, you will find that your keeper rate will increase. And that means better pictures, more sales, and more jobs for the photographer.